During 2008, record precipitation amounts, coupled with already saturated soils, resulted in flooding along many rivers in the United States Midwest. Separate flooding events occurred in January, February, March, April, May, June, July, and September of 2008. The June floods were by far the most severe and widespread with substantial (and in places record) flooding and damage occurring in Illinois, Indiana, Iowa, Kansas, Michigan, Minnesota, Missouri, Nebraska, Oklahoma, South Dakota, and Wisconsin. Indiana had the most recurrent flooding during 2008, with peak-of-record streamflows occurring during January, February, March, June, and September. During 2008, peak-of-record streamflows were recorded at more than 147 U.S. Geological Survey (USGS) streamgages. The annual exceedance probability of the peak streamflows at 25 streamgages was less than 0.2 percent and between 0.2 and 1 percent at 68 streamgages. Trends in flood magnitudes were computed for USGS Midwest streamgages that had no regulation. No Midwest-wide systematic trends upward or downward were evident, although clusters of consistent trends (both upward and downward) were detected in parts of the Midwest. 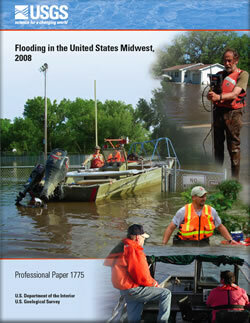 Holmes, R.R., Jr., Koenig, T.A., and Karstensen, K.A., 2010, Flooding in the United States Midwest, 2008: U.S. Geological Survey Professional Paper 1775, 64 p.